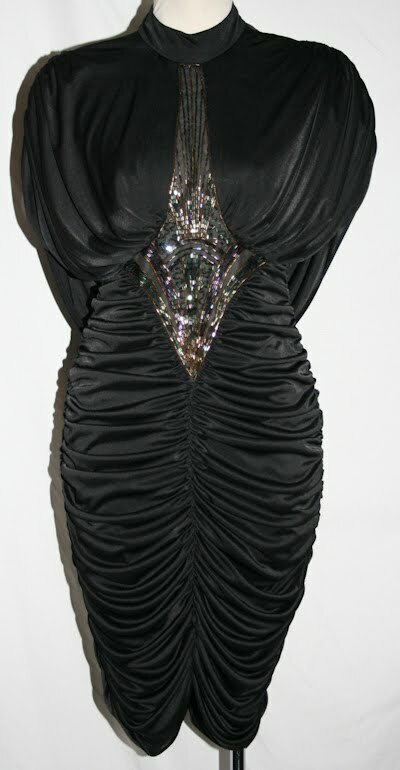 Lots of glamorous black jersey, metallic sequins, alluring ruched seams... it's Vijack! 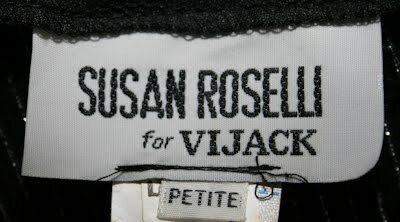 The Vijack label is usually seen in 1970s vintage clothing, though it existed into the 1980s and perhaps even the 1990s. The look is sometimes late disco, though its heyday seems to be that posh status-seeking period in the early 1980s. Think Dynasty or Falcon Crest! The signature Vijack look is definitely sleek and forward-thinking, yet some of its designs have a hard-edged Deco, 1930s or 1940s appeal. Check our site for more vintage Vijack labels... they'll be almost exclusively black, and always a fabulous choice for a Vintage Vixen!